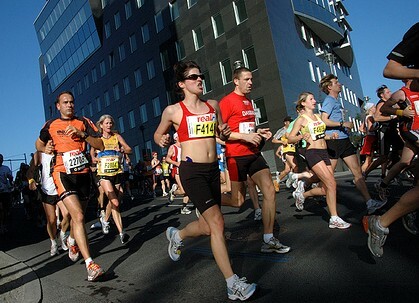 We see a lot of runners at The Center for Podiatric Care & Sports Medicine. Few other types of feet take a bigger beating! Pounding the pavement day in and day out doesn’t have to run your feet out of commission, however. Most of the time, protecting your feet from injury involves providing them with the right support and cushioning. Sadly, this means buying far more pairs of shoes per year than seems prudent. It also takes knowing thyself — foot type, gait, biomechanics — all things we can help you identify here at our NYC sports medicine offices. Find out what you can do to prevent running injuries of the feet before they happen. Are you taking on too much — too soon, too aggressively? Are you warming up and giving equal attention to cooling down after each run? Are you running hills or on uneven surfaces more often than not? Are you listening to pain and backing off, or pushing through it? We can’t emphasize it enough: foot pain is NOT normal. Runners often find it difficult to scale back, even in the face of pain. However, you can benefit from taking a few days a week to swim, bike, or lift weights. You’ll find you are a better athlete when you cross-train, regardless of your primary sport. Physical therapists at our NYC centers specialize in helping people work through pain, without injuring themselves further. Do you supinate or pronate? Are your arches low or high? How flexible is your foot? These questions need to be answered before you can find the proper shoe. Most shoe manufacturers explicitly state which type of foot a particular shoe model has been designed for as they now realize a “one size fits all” design is not helpful to anyone. Injuries like plantar fasciitis and shin splints are directly related to foot type. An NYC podiatrist at The Center for Podiatric Care & Sports Medicine can predict foot problems before they occur based on the structure of your feet. We can also perform gait analysis to see how your foot responds to force. We can identify weak links in foot-ankle-knee-hip alignment and run single-leg balance tests and squats to look for structural anomalies. From there, modification of shoes, stride, or form can go a long way in preventing injury. In some cases, braces, orthotics, or other devices can correct misalignment. 3. Find a shoe and stick with it. There are many brands out there, all with unique variations on cushioning, structure, traction, and heel cup. It can be hard to find good trainers because shoe models vary from one year to the next. So we, usually, tell people to try a pair of new shoes out for a month — and, if it feels real good, stock up on a few pairs to at least get you through the year. Keep in mind that “minimalist” shoes are just racing flats — to be used only for races. Barefoot running can be fine sometimes — on grass or sand — but know your surface and stick with the right type of shoe for your foot type. Our podiatrists are happy to direct you to a good shoe for your particular situation. Call our NYC sports medicine doctors for help! Whether you want help with gait analysis and biomechanics or just a few pointers on form and shoe choice, we are here to help. Our staff includes physical therapists, podiatrists, podiatric surgeons, and experienced runners. We’ve been the official podiatric staff for the New York Marathon and Olympic trials, so you are in good hands with our experts. Book your appointment with a New York sports medicine specialist today.